QUEENS, N.Y. — George Gervin, “The Iceman,” appeared at NBA FIT Day for kids at P4Q School in Queens on January 13, 2015 as he gets ready for next month’s All-Star Game in New York City. Source: N.Y. Daily News. 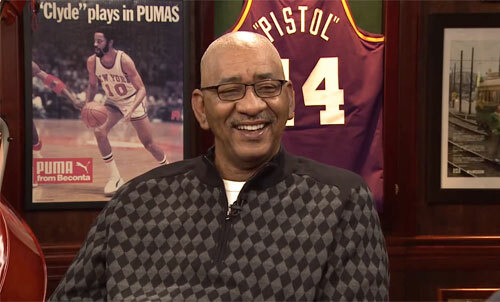 Photo shows George Gervin speaking in a 2014 interview about his career. Watch the following video where NBA legend George “The Ice Man” Gervin speaks with Bill Simmons in a March 2014 interview about his ABA and NBA career. He talks about the merger, playing one-on-one with Dr. J every day after practice, who would join him on his all-time starting five, and what he thinks of the league today. Gervin played in both the American Basketball Association (ABA) and National Basketball Association (NBA) for the Virginia Squires, San Antonio Spurs, and Chicago Bulls. Gervin averaged at least 14 points per game in all 14 of his ABA and NBA seasons, and finished with an NBA career average of 26.2 points per game. Gervin is widely regarded to be one of the greatest shooting guards in NBA history. Sports Speakers 360 is a booking agent for pro athletes. If you would like to book George Gervin for a speaking engagement, appearance or endorsement, contact George Gervin’s booking agent for fees at 1.855.303.5450.